June 22: Election of Officers and Planning Meeting. March 9 – Janet Haller put on a CWA program titled “Down on the Farm”. We learned what state programs, projects: grange trust fund, scholarship fund and camp Berger Maintenance fund, My Sisters Place and contests: NE Needlework will be for this year. Did a word find out of this year’s themes. Also had a round-about reading by picking a topic by opening an egg from a basket of Easter Eggs that contained topics from this year’s programs, projects and contests. At our April 27 meeting we will bake some oatmeal cookies using this year’s state recipe. 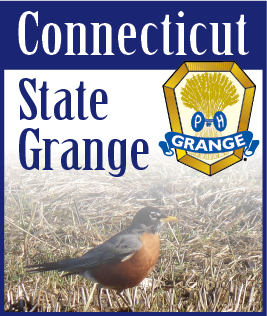 March 23 – Jim Lamoureux put on this meeting’s program titled: “Connecticut Maple Sugaring”. The traditional sugaring season in Connecticut runs from early February to late March. The ideal weather for the sugaring season is warm sunny days for maple trees to start yielding sap and yet stop the sap at night when the temperature drops below freezing. The sap is a colorless liquid that contains about 2 to 4 percent sugar. The sugarmakers as the maple syrup producers are called collect this sap and boil it down. Usually it takes about 40 gallons of raw syrup to get 1 gallon of maple syrup. Once the season begins the sugarmakers work at it almost around the clock since the sap will keep flowing during the season and it needs to be boiled down as soon as possible because otherwise it will spoil. April 13 – Meeting was canceled due to the holiday. April 27 – Janet Haller sent out the ad information for our fair in September. We also talked about the upcoming Mother’s Day Flower and Plant sale on Saturday May 13th, the day before Mother’s day. We plan on having the sale from 8am to 1pm. Dan reported that the upper hall was used by his sailing group so they could spread out and check out their sails for the upcoming sailing season. A “Baking” program by Daniel Lauttenbach. Rather than trying to come up with something to bake, I decided on whipping up a batch of oatmeal cookies using this year’s CWA’s recipe. I found that there was fair amount of ingredients but it was easy to do and towards the end you had to have a strong arm to get them all finally mixed. Using the Grange’s gas range at the recommend temperature they baked fast. I found that you have to watch them just before they are ready to be sure they are not burning. So the first batch had a few dark bottoms and tops but I like them that way anyway and so did more than a few members; especially because they were fresh out of the oven. I used an actual tablespoon measurement to place them on cookie sheets so they made at least 2 dozen plus cookies. There were three spices that you normally don’t find in regular oatmeal cookies and everyone remarked that they had a nice flavor and tasted that they tasted good.